Aristotle (384-322 B.C. ), the most important thinker who has ever lived, advanced a body of thought with respect to the development of the components of a market economy. He analyzed the economic processes surrounding him and endeavored to delineate the place of economy within a society that included commercial buying and selling. It follows that Aristotle's economic writings continue to attract the interest of contemporary thinkers. His economic thought (especially his value theory) is insightful but occasionally contradictory and inconsistent. In the Topics, Aristotle provides his philosophical analysis of human ends and means. He explains that means or instruments of production are valuable because their end products are useful to people. The more useful or desirable a good is, the higher the value of the means of production is. Aristotle then goes on to derive a number of economic ideas from axiomatic concepts including the necessity of human action, the pursuit of ends by ordering and allocating scarce means, and the reality of human inequality and diversity. Aristotle explains that actions are necessarily and fundamentally singular. For Aristotle, the individual human action of using wealth is what constitutes the economic dimension. The purpose of economic action is to use things that are necessary for life (i.e., survival) and for the Good Life (i.e., flourishing). The Good Life is the moral life of virtue through which human beings attain happiness. Given that human actions are voluntary and intentional, it follows that action requires the prior internal mental acts of deliberation and choice. Human beings seek to fulfill their perfection via action. Observing that human nature has capacities pertaining to its dual material and spiritual character, Aristotle explains that economics is an expression of that dual character. The economic sphere is the intersection between the corporeal and mental aspects of the human person. Aristotle made a distinction between practical science and speculative science. He states that practical science is concerned with knowledge for the sake of controlling reality. It studies knowledge that may be otherwise (i.e., contingent knowledge). Practical science studies relationships that are not constant, regular, or invariable. Aristotle classifies economics as a practical science. On the other hand, Aristotle sees speculative science as yielding necessary, universal, noncontingent truths. Speculative science generates universal truths deduced from self-evident principles known by induction. The goal of speculative science is knowledge for its own sake. Mathematics and metaphysics would be speculative sciences for Aristotle. Aristotle taught that economics is concerned with both the household and the polis and that economics deals with the use of things required for the good (or virtuous) life. As a pragmatic or practical science, economics is aimed at the good and is fundamentally moral. Because Aristotle saw that economics was embedded in politics, an argument can be made that the study of political economy began with him. For Aristotle, the primary meaning of economics is the action of using things required for the Good Life. In addition, he also sees economics as a practical science and as a capacity that fosters habits that expedite the action. Economics is a type of prudence or practical knowledge that aids a person in properly obtaining and using those things that are necessary for living well. The end of economics as a practical science is attaining effective action. Aristotle explains that ontologically the operation of the economic dimension of reality is inextricably related to the moral and political spheres. The economic element is integrated in real action with other realms relating to the acting human person. The various domains mutually influence one another in an ongoing dynamic fashion. Aristotle explains that practical science recognizes the inexact nature of its conclusions as a consequence of human action which arises from each person's freedom and uniqueness. Uncertainty emanates from the nature of the world and the free human person and is a necessary aspect of economic actions that will always be in attendance. Aristotle observes that a practical science such as economics must be intimately connected to the concrete circumstances and that it is proper to begin with what is known to us. In the Politics, Aristotle views labor as a commodity that has value but does not give value. Rejecting labor as the source of wealth, Aristotle did not formulate the labor theory of value but instead held a theory of the value of labor. Aristotle observed that labor skill is not a determinant of exchange value. Instead, the value of labor skills is given by the goods they command in the market. He maintained that value is not created solely by the expenditure of labor in the production process. Noting that labor skill is a necessary, but not a sufficient, determinant of value, he explains that both utility and labor skills are pertinent to the determination of exchange values and exchange ratios. He says that, in the end, the basic requirement of value is utility regarding a person's desires. Value is the ability to satisfy wants. Demand is governed by the desirability of a good (i.e., its use value). According to Aristotle, exchange value is derived from use value as communicated through market demand. In Book I of the Politics, Aristotle distinguishes between use value and exchange value. It was Aristotle who created the concept of value in use. The use value or utility of a good or service depends upon its being productive of an individual person's good. He explains that the use value of a given article can vary among individuals and that the demand for the item is a function of its use value. Aristotle observes that, as the quantity of the good possessed increases, the use value of that good will begin to decline at some threshold point. He also holds: that the use value of a good or service will be increased if it can be consumed conspicuously; that demand will fluctuate as the extent of the use of the item is limited or wide-ranging; and that exchange value and demand are affected by the circumstances of rarity or scarcity. In addition, Aristotle distinguished between one's possessions (i.e., final goods) and instruments (i.e., factors) of production and noted that the desirability of means to an end will vary in accordance with the desirability of the end itself. In the Topics and in the Rhetoric he says that the instruments of production derive their value from the instruments of action (i.e., the final products). Observing that economic goods derive their value from individual utility, Aristotle glimpsed the role of diminishing marginal utility in price formation. He recognized that the value of something could be established by discovering what its addition to (or subtraction from) a group of commodities did to the total value of the group. In the Topics he stated that the value of one good could be determined if we add it or lose it to a given complex of things. The more we gain by the addition of the good, the higher its value and the greater the loss from the absence of the good, the more desired the commodity is assessed to be. He also says that we judge between commodities by means of an addition to see whether the addition of commodity A or the addition of commodity B to a group makes the whole group more desirable. According to Aristotle, the quantity of a good reaches its saturation point when the use value plunges and becomes immaterial. In Book I of the Politics he points out that natural pressures of diminishing utility for goods direct remaining human energy toward moral self-improvement. Aristotle discovered, formulated, and analyzed the problem of commensurability. He wondered how ratios for a fair exchange of heterogeneous things could be set. He searched for a principle that makes it possible to equate what is apparently unequal and noncomparable. Because each thing has a substance or telos it is by nature different from any other thing. His challenge was to discover how diverse products can be commensurable and thus have an exchange value or price. Aristotle's objective was to prove that every exchange of goods has to be an exchange of equivalents. How can goods of different quality which are exchanged because of these qualitative differences be compared with each other and be equalized? Aristotle says they must be equalized somehow by some common measure. There must be some dimension in which they are comparable if the goods are to be equalized. Aristotle was thus working from the premise that there will be no exchange without equality and that there can be no equality without commensurability. In other words, when people associate for the exchange of goods each must be satisfied that both utilities and costs are equalized before exchange takes place. Persons stand as equals in exchange as soon as their commodities are equalized. Aristotle makes several attempts to solve this paradox. In his first effort at solving this paradox, Aristotle says that money, as a common measure of everything, makes things commensurable and makes it possible to equalize them. He states that it is in the form of money, a substance that has a telos, that individuals have devised a unit that supplies a measure on the basis of which just exchange can take place. Aristotle thus maintains that everything can be expressed in the universal equivalent of money. He explains that money was introduced to satisfy the requirement that all items exchanged must be comparable in some way. His thinking was that a common standard of measurement comprises commensurability and makes the equalization of goods possible. Aristotle then realized that the possibility of a measure presumes prior commensurability with respect to the dimension by which measurement is possible. He therefore sees his idea as deficient. He next says that goods become commensurable in relation to need – the unit of value is need or demand. Need, rather than something in the nature of goods, is what makes them epistemically commensurable. Aristotle observes, however, that although need is capable of variable magnitudes, it lacks a unit of measure until money is introduced to provide it. Ultimately, he concludes that it may be impossible for different goods and services to be strictly commensurable. In his idea of commensurability Aristotle was the first to identify a serious and authentic problem of economics. Perhaps he was searching for a way of setting justifiable ratios for fair exchange so that product could be treated as "commensurable enough" to permit the exchange. The good must be an object of need that is expressible as money and the ratios must be quantitative and "precise enough." In Book V of the Nicomachean Ethics and Book I of Politics Aristotle distinguishes between universal justice and particular justice. Economic dealings are subject to the rules of particular justice. Particular justice involves quantitative relationships. Many writers say that Aristotle only includes distributive and corrective (i.e., rectificatory) under this category but other scholars say that he also means to include commutative (i.e., reciprocal) justice under this classification. "Aristotle's economic criticisms are directed at wealth-getting in the sense of money-making. He disregards the fact that men were able to search for unlimited wealth even before money came into existence." He says that distributive justice is natural justice and involves balancing shares with worth. In turn, rectificatory justice involves straightening out by removing unjust gain, restoring unjust losses, and other forms of retribution for loss and/or damages. Reciprocity involves the interchange of goods and services and does not coincide with either distributive or corrective justice. Reciprocal justice involves comparative advantages and is concerned with particularized mutual benefits derived from specialization of function. In the Nicomachean Ethics Aristotle states that exchange depends on equality of both persons and commodities. It is in this work that he concentrates on the problem of commensurability. 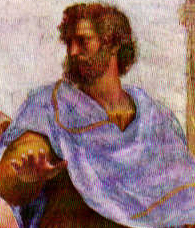 Aristotle used artisans as examples for his general and abstract discussions found in this work. In Book V of the Nicomachean Ethics he deals with justice, is concerned with determining proper shares in various relationships, analyzes the subjective interactions between trading partners looking for mutual benefit from commercial transactions, develops the concept of mutual subjective utility as the basis of exchange, and develops the concept of reciprocity in accordance with proportion. In the Nicomachean Ethics, Aristotle, in his treatment of justice, applied the concepts of ratio and proportion to explain just distribution. Aristotle states that fair exchange is a type of reciprocity, not of equality, but rather of proportion. This is achieved by equalizing proportions of products. His concern here is with the ratios in which goods are exchanged. Individuals create products of different value and unequal creators are made equal through the establishment of proportionate equality between the products. This led Aristotle to the consideration of commensurability and to inquire into the notion of exchange values. According to Aristotle, value is assigned by man and is not inherent in the goods themselves. He says that exchange occurs because what the participants want is different from what they have to offer. Need plus demand is what goes into determining proportionate reciprocity in a given situation. Aristotle explains that the parties form their own estimations, bargain in the market, and make their own terms and exchange ratios. The exchange ratio is simply the price of things. For Aristotle, voluntary is presumed just. Exchange must be mutually satisfactory. He sees mutuality as the basis for exchange and the equating of subjective utilities as the precondition of exchange. There is a range of reciprocal mutuality that brings about exchange. The actual particular price is determined by bargaining between the two parties who are equal as persons and different only with respect to their products. Aristotle appears to have recognized the subjective and relational nature of an exchange ratio. He observed that an exchange ratio is not a ratio of goods alone nor merely a ratio of people exchanging the goods involved in the transaction. Rather, it is simultaneously a ratio reflecting the interrelationships among and between all of the people and all of the goods involved in this transaction. This ratio of proportionate reciprocity is used to equalize both goods and persons. For Aristotle, money is a medium of exchange that makes exchange easier by translating subjective qualitative phenomena into objective quantitative phenomena. Although subjective psychological want satisfaction cannot be directly measured, the approximate extent of want satisfaction can be articulated indirectly through money. Not only does money eliminate the need for a double coincidence of wants, it also supplies a convenient and acceptable expression for the exchange ratio between various goods. Money, as an intermediate measure of all things, is able to express reciprocity in accordance with a proportion and not on the basis of a precisely equal ratio. Money, according to Aristotle, has become a convention or type of representation, by which all goods can be measured by some one thing. Money, as a modulating element and representation of demand, becomes a useful common terminological tool in the legal stage of the bargaining process. In the Politics, Aristotle discusses exchange, barter, retail trade, and usury. He explains that exchange takes place because of natural needs and the fact that some people have more of a good and some have less of it. He says that natural exchange redistributes goods to supply deficiencies out of surpluses. Voluntary exchange occurs between self-sufficient citizens who exchange surpluses, which they value less, for their neighbor's surpluses, which they value more. For Aristotle, true wealth is the available stock of useful things (i.e., use values). He is concerned with having enough useful things to maintain the needs of the household and the polis. He says that wealth-getting that aims at use-value is legitimate. Use-value or true value involves goods that are necessary for life and for the household or the community of the city. Aristotle considers both the household and the polis to be natural forms of association. It is not against nature when individual households mutually exchange surpluses to satisfy the natural requirement of self-sufficiency. Aristotle considers friendship to be a necessary condition for natural exchange. Aristotle maintains that property must be used in a way that is compatible with its nature. Its use must benefit the owner by also being a necessary means of his acting in correspondence with his own nature. In the Politics, Aristotle distinguishes between natural and unnatural acquisition and discusses the problem of excess property. He says that the right to property is limited to what is sufficient to sustain the household and the polis life of the city. He explains that exchange between households requires mutual judgments of equal participants in the life of the polis. The life of the household is a sound and productive means to polis life if it produces only the necessary goods and services that provide a setting for the exercise and development of the potentialities required for polis life. Aristotle emphasizes the importance of natural limits in a system of natural relationships. He says that natural exchange has a natural end when the item needed is acquired. Production is the natural process of obtaining things for life's needs. Aristotle maintains that there is a limit to the amount of property that can be justifiably acquired as well as a limit to the ways in which it can be legitimately acquired. According to Aristotle, a household relies on exchange to supply property necessary to the household so that the citizen can develop his humanity. Natural exchange operates within an environment of friendship and mutual concern to complement the basic self-sufficiency of the household. Natural exchange between households requires the exercise of virtues and furnishes a bridge between one's work and well-being. A wide range of material goods is needed to attain a person's moral excellence. Economic activity is necessary to permit leisure and the material instruments necessary for a person to develop the full range of his potential and thereby flourish. Aristotle teaches that eudaimonia involves the total spectrum of moral and intellectual excellences. Aristotle explains that wealth derives its value from its contribution to the acquisition of other goods desirable for their own sake. Wealth and external or exterior goods are instruments that facilitate virtuous activity and eudaimonia, are means to an end, and have some natural limit with respect to each individual. Aristotle says that the polis exists for the sake of the good life, that the polis is a partnership in living well, and that mutual interaction is the bond that holds society together. He observed that people are related to each other through the medium of goods but that acquisition beyond the necessary diverts the citizen's capacities from the sphere of polis life. Advocating an inclusive-end teleology, Aristotle endorsed an active life devoted to a wide range of intellectual and moral perfections including the active engagement in civic affairs. In the Politics, Aristotle advanced the synergistic idea of social aggregation with the aggregate benefits to people exceeding the objective total of the benefits to individuals qua individuals. He sees this excess amount of benefits as a positive measurement of the goodwill created through association and as a reflection of the unifying strength of a society. In part, it is the mutual benefits of exchange which bring people together with one desiring another's goods more than he desires his own and vice versa. In the Politics, Aristotle delineates the historical development of money from its initial existence as a commodity. He also discusses the entire range of commodity exchange including barter, retail trade, and usury. Aristotle declares that the first type of exchange, barter, the direct non-monetary exchange of commodities, is natural because it satisfies the natural requirement of sufficiency. After direct working of the land, barter between households is the next most natural means of wealth acquisition. For Aristotle, natural exchange is based on the right to property being determined by the capacity for its proper use. He sees barter as natural but inadequate because of the difficulty of matching households with complementary surpluses and deficiencies. The concepts of surplus and deficiency are normative and derive from the right of property. Aristotle is irresolute and ambivalent regarding the second form of exchange which involves the transferring of goods between households but mediated by money. Here each participant starts and ends with use value which he approves of but the item is not being used in its natural aim or function because it was not made to be exchanged. Aristotle observes that what is natural is better than what is acquired and that an item that is final is superior to another thing that is wanted for the sake of this item. The introduction of money eliminates the problem of the double coincidence of wants. For Aristotle, the legitimate end of money is as a medium of exchange but not as wealth or as a store of value. He observed that money became the representation of want by agreement on law. A currency acceptable within the polis permits the full potential to be realized. Aristotle thought that money departs from its natural function as a medium of exchange when it becomes the beginning and end of exchange with no limit to the end it seeks. The ease of exchange permitted by the use of money makes it possible to engage in large production projects for exchange purposes instead of for direct household use. This can corrupt natural exchange for which money is a valuable instrument. Money, rather than serving simply to facilitate commodity exchange, can become the goal and end in itself. In the third form of exchange, retail trade, a person buys in order to sell at a profit. Retail trade is concerned with getting a sum of money rather than acquiring something that is needed and therefore consumed. Whereas Aristotle views household management as praiseworthy and as having a natural terminus, he is skeptical about retail trade because it has no natural terminus and is only concerned with getting a sum of money. Retail trade knows no limits. When money becomes an intermediate element in exchange, the natural limits on physical wants no longer exercise restraints on a person's desires. The lack of effective natural restraints leads to the unlimited desire for wealth. There exist no natural conditions restricting a person's desire to acquire money wealth. For Aristotle, retail trade is not a way of attaining true wealth because its goal is a quantity of money. He criticizes money-making as a way of gaining wealth. The end of retail trade is not true wealth but wealth as exchange value in the form of a sum of money. Aristotle observes that exchange value is essentially a quantitative matter that has no limit of its own. He says that it is from the existence of wealth as exchange value that we derive the idea that wealth is unlimited. In Book V of the Nicomachean Ethics, Aristotle states that commodity exchange between craftsmen is a natural but inferior form of exchange that is not closely connected to polis life. He says that craftsmen are involved with specialized production based on unlimited and unnatural acquisition, are not the equals of household heads, and are therefore unsuited for citizenship and for polis life. The fourth form of trade is usury – the begetting of money from money. Aristotle says that the usurer is the most unnatural of all practitioners of the art of money-making. The lending of money at interest is condemned as the most unnatural mode of acquisition. Aristotle insisted that money was barren. He did not comprehend that interest was payment for the productive use of resources made available by another person. Aristotle's economic criticisms are directed at wealth-getting in the sense of money-making. He disregards the fact that men were able to search for unlimited wealth even before money came into existence. Although he realized that wanting too much is a human failing, he placed a great deal of blame on money because it had no natural terminus. Aristotle taught that when a man pursues wealth in the form of exchange value he would undermine the proper and moral use of his human capacities. He fails to mention that men of commerce provide useful public service and make money only if they do so. Aristotle saw so much even in the field of economics. He foresaw significant elements of Austrian value theory. For example, he glimpsed the concept of diminishing utility and its application to exchange value (i.e., price) determination. He held a theory of the importance of value determination in evaluating the efficiency of means in attaining human objectives. He also anticipated the Austrian theory of imputation that holds that the value of productive factors can be obtained via imputation from the market values of final products. Aristotle was the first to draw a distinction between value in use and exchange value. His pre-marginal utility theory also rejected the labor theory of value that later was held by many of the classical economists. In addition, he was the first thinker to analyze the problem of commensurability. Additionally, Aristotle recognized the paradox of value and the operation of the principle of scarcity. Although Aristotle's economic insights and influence on the development of economic thought were considerable, he did make some errors and failed to fully appreciate that markets and money-making activities could provide a mechanism through which order in society could be produced through individuals pursuing their own ends. Nevertheless, Aristotle is one of the great thinkers in the history of economic thought.